Large trucks without question are essential to Southern California’s economy, but they also have the potential to cause injury, collisions, and deadly accidents on our state’s freeways. Trucks and tractor-trailers are typically much heavier and larger in size even when they are not carrying a full load than average passenger vehicles. Therefore, in the event of a collision, just the sheer mass and size of these trucks tends to result in significant injuries and damages to the occupants of the smaller passenger car. Such big rig accidents also commonly lead to multiple fatalities. Often, these types of accidents are caused by truck driver error, negligence or wrongdoing. Trucking companies and corporations that operate these large trucks to transport goods can also be held accountable for accidents that are caused by poor vehicle maintenance and negligent hiring and/or negligent employee retention. If you or a loved one has been injured in a large truck accident, you need an experienced Los Angeles truck accident lawyer on your side who will fight for and protect your rights every step of the way. 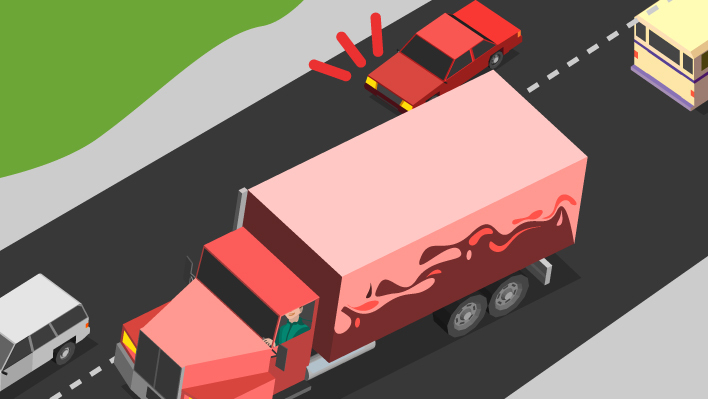 Why is a Truck Accident Different? So, what makes a large truck accident different from an average car accident on the roadway? First and foremost, the damages and stakes are often higher in a truck accident. When a truck weighing about 80,000 pounds strikes a 2,000-pound car, the resulting injuries and losses can be devastating for the occupants of the passenger vehicle. According to the Insurance Institute for Highway Safety (IIHS), a majority of large truck accidents tend to injure passenger vehicle occupants. Drivers and passengers in a smaller vehicle struck by a large truck are likely to suffer catastrophic or fatal injuries. According to the National Highway Traffic Safety Administration (NHTSA), in 2016, there were nearly 11.5 million large trucks registered nationwide. During that same year, 4,317 people were killed in large truck accidents in the United States. Roughly 15 percent of these deaths involved truck occupants and the rest involved passenger vehicle occupants as well as pedestrians, bicyclists or motorcyclists. This has been a consistent trend in big rig accidents over the years showing that others on the roadway are disproportionately affected as a result of these large truck accidents, which makes them quite different from any other type of auto accident. Large truck accidents also tend to be much more complex because there are a number of other parties involved than just the truck drivers. This means that the truck operator’s insurance company and defense counsel will get involved in the accident investigation as soon as the crash occurs in order to protect the interests of the operator or the corporation that owns the truck and/or employs the driver. They will try all the tricks in the book from denying facts or concealing evidence in the case to offering a quick, low settlement to make the case go away. It is important that you never rush into a quick settlement especially in a truck accident case where it might take several months to determine what type of compensation you need for ongoing treatment and care. All of these factors make a truck accident case significantly more complex to handle than the average auto accident case, and therefore requires the expertise and knowledge of an experienced Los Angeles truck accident lawyer. Jackknife accidents: This is when a truck that brakes fast and hard causes its trailer to skid outward creating a 90-degree angle to the front part of the truck’s cab. 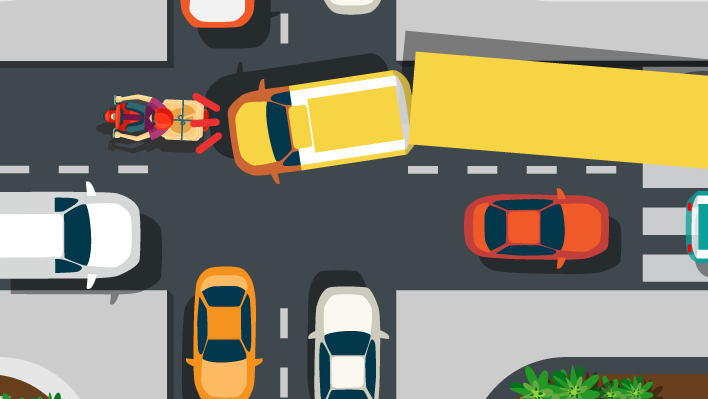 Jackknifing trucks, apart from causing a mess on Los Angeles freeways, have the potential for freeway pileups resulting in multiple injuries or even fatalities. Cabs and trailers may also rollover or tip over to the side causing collisions with other motorists. 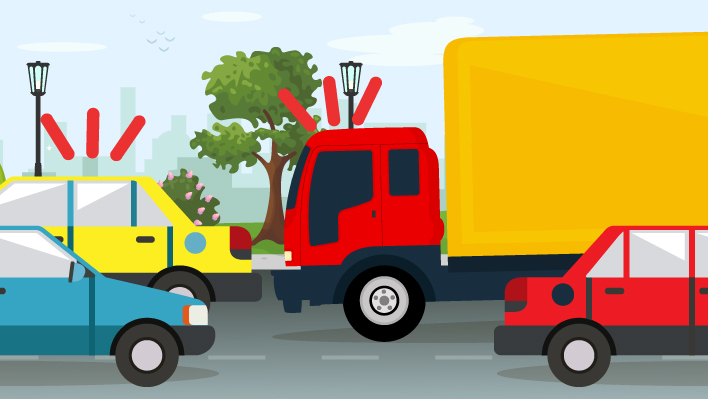 Jackknifing accidents may occur because of overloaded or improperly loaded trailers. It is the responsibility of trucking companies to ensure that large trucks are properly loaded so they don’t go out of control and cause these types of devastating crashes. Underride crashes: These crashes occur when smaller passenger vehicles slide under the trailer of a large truck. Many underride accidents involving big rigs involve a smaller vehicle hitting the truck from the side or from behind. The problem occurs because the trucks are high enough to allow smaller vehicles to slide underneath. The roof and passenger area of the vehicle is often crushed or sheared off as the vehicle goes under the trailer. Truck underride accidents are a significant cause of catastrophic injuries and deaths each year. NHTSA estimates that 423 people die and more than 5,000 are severely injured in truck underride accidents each year. The Federal Motor Carrier Safety Administration (FMCSA), which monitors commercial vehicles, has required that big rigs use both rear impact guards and reflectors or reflective tape since 1999. However, the guards are only required on trucks manufactured after 1998 leaving many without the guards. IIHS performed a crash study on the effectiveness of rear impact guards and found that even at speeds as low as 35 mph, the guards could bend allowing the smaller vehicles to still slide underneath. Truck underride collisions result in traumatic brain injuries, spinal cord trauma and even decapitations. Blind spots: Since a truck’s blind spots can be significant, the truck driver sometimes may not be able to see other vehicles that are changing lanes. This puts vehicles at risk of being hit, crushed or forced off the roadway. 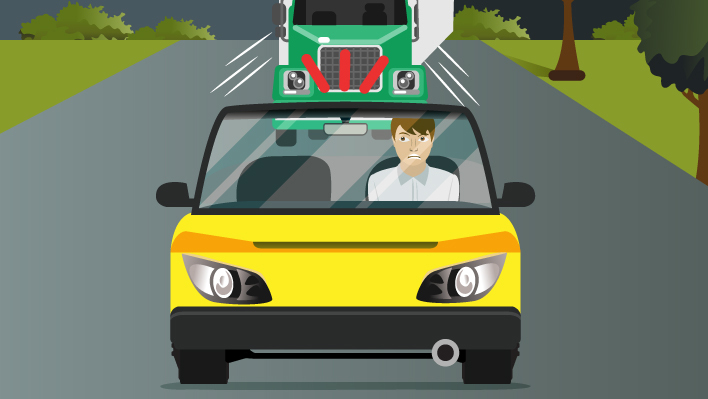 Rear-end collisions: When a large truck strikes a smaller vehicle from behind, the damages to a smaller vehicle can be significant. Rear-end crashes may occur as a result of impaired driving, fatigued truck drivers who don’t take the required rest breaks and distracted driving, etc. Excessive speed or driving at an unsafe speed could also lead to rear-end truck accidents. Because of their longer stopping distance, driving at an unsafe speed puts trucks at a higher risk of getting in an accident. 11-hour driving limit: Truck drivers may drive a maximum of 11 hours after 10 consecutive hours off duty. 14-hour limit: Truck drivers may not drive beyond the 14th consecutive hour after coming on duty, following 10 consecutive hours off duty. Off-duty time does not extend beyond the 14-hour period. Rest breaks: Truck drivers may drive for a total of eight consecutive hours. After eight hours have passed, they must take a 30 minute break. 60/70-hour limit: Truck drivers may not operate after 60/70 hours on duty in 7/8 consecutive days. A driver may restart a 7/8 consecutive day period after taking 34 more consecutive hours off duty. According to current laws, truck drivers are required to maintain electronic logs of when they work. This is an important piece of evidence, which could help determine whether a truck driver was drowsy or fatigued at the time of the collision. Preservation of evidence can be crucial to the success of any auto accident claim including claims that stem from truck accidents. Evidence is key when it comes to proving fault and determining the nature and extent of your losses. Very often, we see that some of the most critical pieces of evidence are the ones that are available immediately after the crash. Truck accident claims are extremely complex and could potentially involve several weeks of investigation by involved parties such as defense lawyers and insurance companies to determine the severity of the victims’ injuries, fault, liability and other facts. Trucking company files: This may include business records, pay records, driver call-in logs, phone records, dispatching records, daily vehicle inspection reports, driver’s daily logs (paper and electronic) and other documents that are routinely produced during the course of business. Vehicle inspection records: This refers to all maintenance records for the trucks that are owned and operated by the company, all inspection records and training certifications. Insurance information: Most truck companies carry about $1 million in liability insurance coverage. You would need copies of any insurance policies, names of insured persons, excess insurance policy details, etc. Device records: This might include any satellite tracking system records, on-board even data recorders or “black box,” which could show key details such as whether or not the truck driver applied the brakes before the crash and at what speed the vehicle was traveling. Driver records: This includes hiring records, job application documents, background records, training information, accident and injury reports, commercial driver’s license (CDL) records and alcohol or drug-testing records. Our Los Angeles truck accident attorneys know fully well that these types of crucial evidence can be lost, destroyed or misplaced very quickly after a truck accident. So we send what is known as a spoliation letter to the applicable parties, listing the specific evidence that must be preserved. Once the parties receive this letter they are required to preserve these pieces of evidence. One of the questions we get often from truck accident victims is how much compensation they can collect. The answer to that question is complicated. Most trucking companies have policy limits of up to $1 million. Larger corporations may have additional layers of insurance coverage. An experienced Los Angeles truck accident lawyer will be able to explore all avenues of compensation to help you obtain maximum compensation for your injuries and losses. Since each truck accident case is unique, the damages will depend on a number of factors. Here are some of those elements that could determine what your case is worth. Medical bills: This includes expenses for medical services such as doctors, hospital stays, emergency room treatment, transportation costs, cost of medications, medical equipment, in-home care, surgeries, etc. It is important that you document the treatment and care you sought and received. This includes preserving important documents such as doctors’ reports, invoices, bills and so on. Property damage: You can also seek compensation for the damage caused to your vehicle and other property. Any types of photographic or video evidence might serve you well when it comes to proving the extent of property damage you sustained. This is why it is important to get photos and video at the accident scene before it is cleared. If you have to get to a hospital, ask a family member or friend to obtain this information for you. Lost income: These damages refer to the amount of money you would have earned from the time of the injury to the date of the verdict or settlement in your truck accident case. In addition to the wages lost, you may also be able to get compensation for lost future earning capacity if your injuries happen to be catastrophic or disabling. Pain and suffering: The types of injuries caused by truck accidents, in addition to being physically disabling, can also cause significant psychological issues such as depression and post-traumatic stress disorder or PTSD. Disfiguring injuries in particular could cause significant emotional stress and trauma. You could seek compensation for physical pain and emotional distress. Your injury lawyer can help you place a monetary value on pain and suffering. The compensation for emotional distress could depend on a number of factors including the extent of your injuries, recovery time, bodily harm, disfigurement and so on. Punitive damages: Truck accident victims may be awarded punitive damages in addition to compensatory damages in particularly egregious cases where the court wishes to punish the defendant for their negligence. If you or a loved one has been injured in a big rig accident, the experienced Los Angeles truck accident lawyers at TorkLaw can help you better understand your legal rights and options. We provide compassionate and quality legal representation to injured truck accident victims and their families. We work on a contingency fee, which means you don’t pay any fees unless we recover compensation for you. Please call us today for a free consultation and case evaluation.